Our conference gathered under the visual auspices of two images. * The first, which served as our locandina or conference poster, was taken from the beautifully evocative book cover illustration to Laura Tosi’s Italian adaptation for children of Il Mercante di Venezia. Produced by Desideria Guicciardini in saffron yellows, peach and cherry pinks, liquid aqua and deep purple, it gives a child’s view of Venice along the grand canal, its palazzi mirrored in the water that laps them. And it positions Antonio, a feather in his merchant’s cap, in a gondola, facing Shylock, robed in yellow, who stands on a bridge (perhaps the one that links the Ghetto Novo where he lives to the city and the Rialto where traders meet, deals are done and money loaned to chancers bank-rolling their next high-risk adventure?). 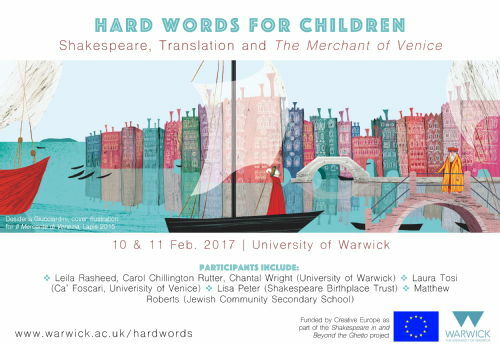 Thus, Guicciardini’s illustration holds together in a single frame visual citations of many of the ‘hard words’ that children will encounter in Shakespeare’s Merchant of Venice. It gives them reference points for the stand-offs underwriting the hazards and fueling the antagonisms that play out across this magical city whose roads are water and whose citizens hide behind masks when they dance in the dark, narrow streets. The second illustration was borrowed from the Little Angel puppet theatre’s production of The Tempest (2011, in association with the Royal Shakespeare Company). It showed Caliban, a ‘monster’ built to the specifications of a child’s imagination, truly terrifying (he had red eyes that glowed when he was angry) but also deeply endearing (he wagged his head like a dog protesting ‘No!’ when the shipwrecked strangers on his island called him ‘monster’). I wanted this Caliban at the top of our conference as a reminder of the contradictions built into any of our adult conversations about ‘the child’ and ‘childhood’. 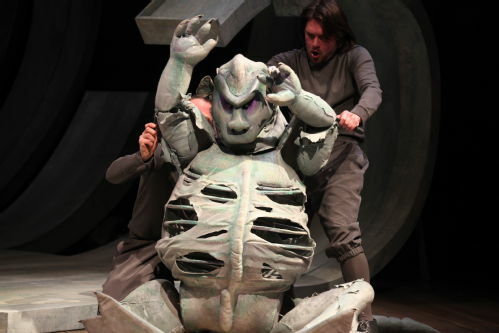 Caliban is an orphan adopted by Prospero. He’s a brother to baby Miranda who, growing, is tutored by her father. She in turn teaches Caliban to talk. When the little ‘savage’ did not ‘know [his] own meaning’, but would ‘gabble like / A thing most brutish’, she ‘endowed [his] purposes / With words that made them known.’ Words. Hard words, it turns out, for as Caliban retorts, ‘You taught me language, and my profit on’t / Is I know how to curse’. Across the two days of our conference the participants heard brilliant scholarly papers on the history and diversity of translating, adapting, and re-writing Shakespeare for children and that offered a critical comparative analysis of some the schools texts currently available. We looked at how Shakespeare’s ‘hard words’ are being used in children’s performances in conflict zones to work toward conflict resolution. We took pencils in hand in workshop mode to experiment with our own translations, and we got up on our feet to play with text, to embody, try on and try out the work the best teachers of Shakespeare in schools are producing in today’s classrooms. We have archived the conference materials here so that those who were unable to attend can access some part of what went on – and so that the conversations, the ‘hard words’, can continue. *This conference was supported by the European Union’s ‘Creative Europe’ fund as a dissemination event in the ‘Shakespeare In and Beyond the Ghetto’ project (led by Dr Shaul Bassi, Ca’ Foscari, University of Venice, in association with the Cini Foundation and other European partners). I am grateful to my Warwick colleagues for their superb contributions to the success of the conference, Dr David Taylor for producing the locandina; Dr Rebecca Fisher for faultless administrative organisation; and Ms. Siobhan Brennan for on-site ushering, timekeeping, and general management. I am also grateful to the speakers who produced such impressive content and the participants who all joined the conversations and exercises with enthusiasm and energy. This conference staged a genuine meeting of minds. Want to know more? Complete this form to request more information. Do you have a specific question for the team?